“I’m in Love with the shape of you” – Is what the people around us said when the all new Renegade Commando from UM Motorcycles was taken out for review. 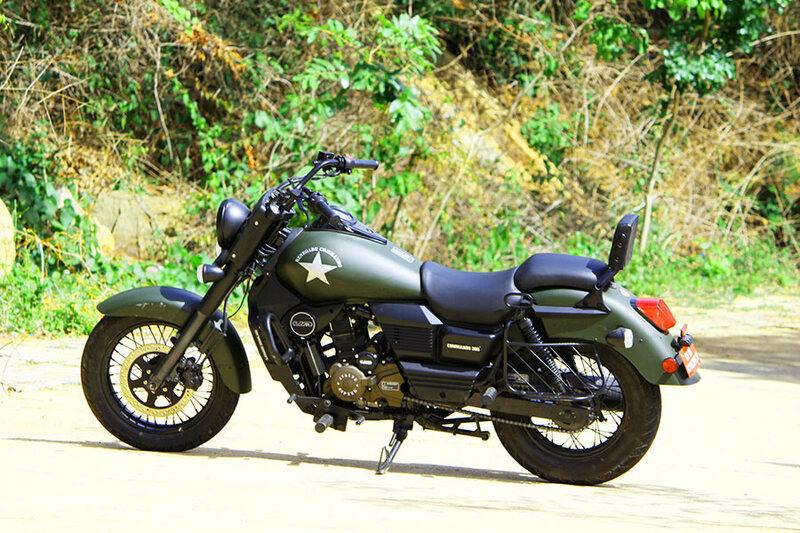 It is a cruiser with stand-out design that hits on your eye as a Military or Army motorcycle. The curious people around us were anxious enough to walk to us to check out which model it is and told us they have never seen something like this and put forth few questions like “Is this a bullet?”, “Is it a military bike?”, “How much does this cost?”. 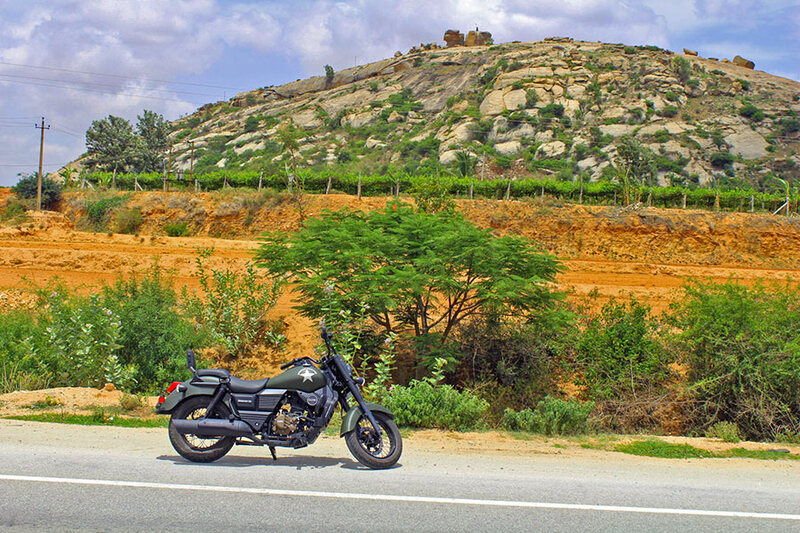 Bangalore’s “Silicon City UM” dealership is from where we were asked to pick the motorcycle for review. Any motorcycle above 200cc is expected to consume more fuel and we were privileged enough to get the Renegade Commando with full tank fuel to explore the motorcycle to the fullest. 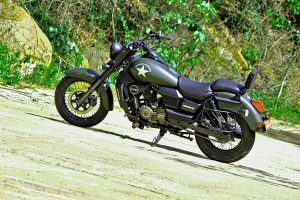 At the first, when you look at the motorcycle – You will observe and feel the heaviness and massive looks of this bike. You can notice the Military green color consistently painted through out the motorcycle and the “Star” on fuel tank of the motorcycle. 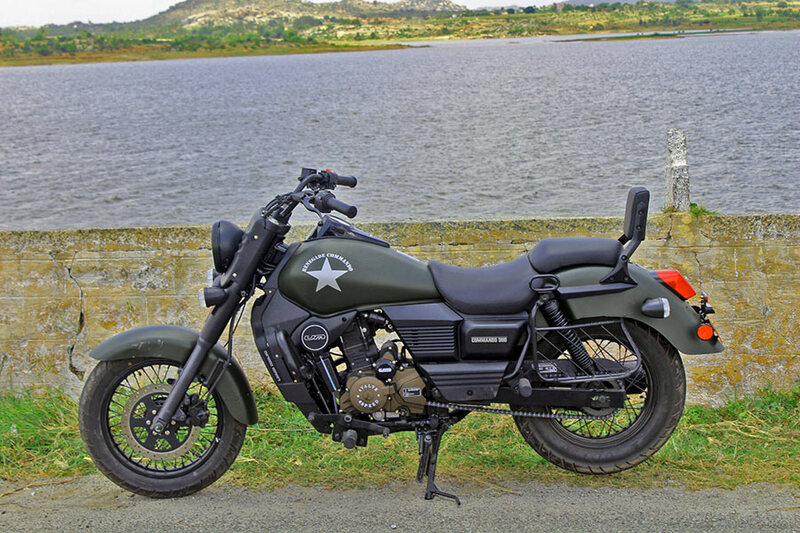 Available in 3 colors, the Renegade Commando which is now being reviewed is “Matte Moss Green“. The circular headlamp is coned and projected outside which again adds to the looks of the bike. There is an ample space and you get split seats and at the back you will be getting a pillion rest as well. 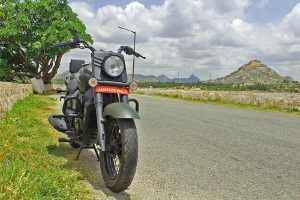 There is nothing like dashboard in this motorcycle. You will see a very simple classic speedometer along with digital fuel gauge meter. 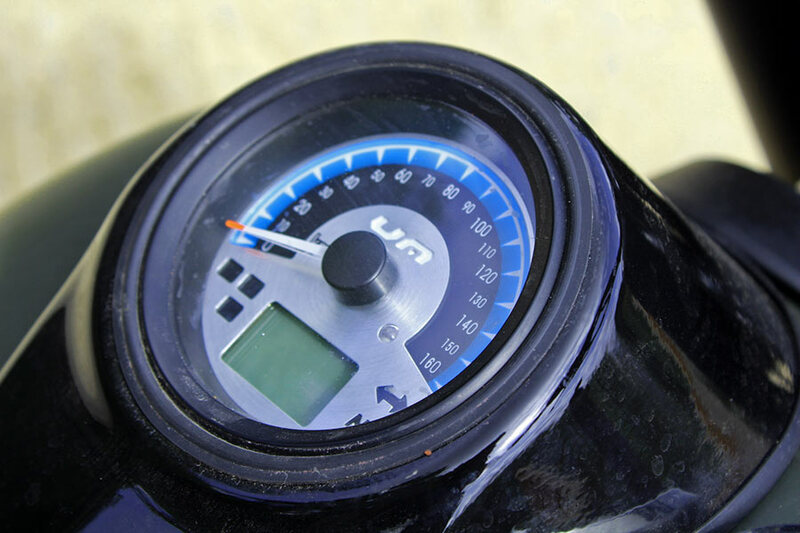 What is interesting is the speedometer which is mounted on top of tank, very much in front of your seat. You can notice UM branding in the speedo area which is illuminated even at the night times and you also get a bonus USB charging pin in a pretty apt position. There is also a blinking Red LED attached which we think is an indicator for anti-theft function or a GPS locator. We are yet to figure out what it is from UM. 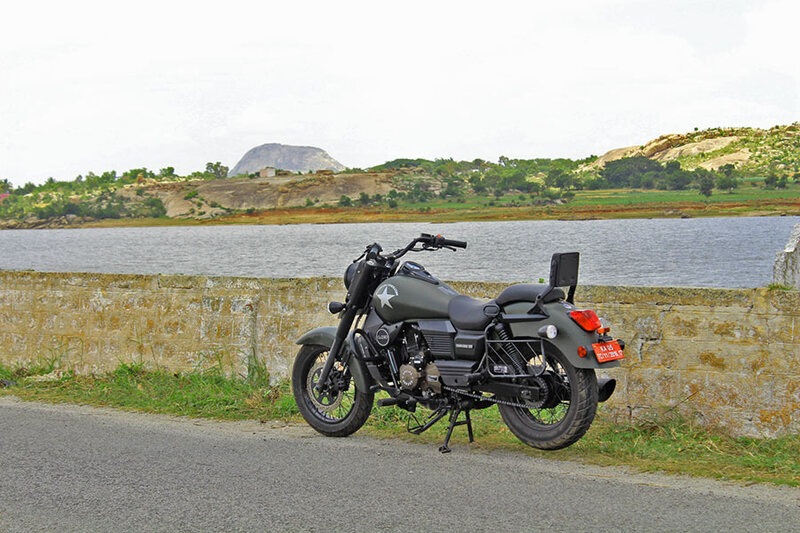 As narrated in first impressions, the motorcycle mainly woes because of its looks. 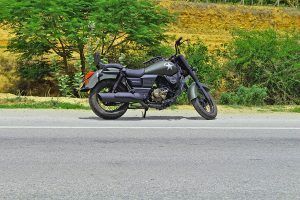 Talking in terms of motorcycle design with respect to rider, as it is a cruiser motorcycle you will have to stretch your legs way too front in order to reach the gears and brake pedal. If you are not used to riding the cruiser bikes, you will need sometime to get adjusted to it. Sometimes we felt the gear lever is pretty hard while switching from one position to the other. The higher gears are easier to shift than the lower ones. 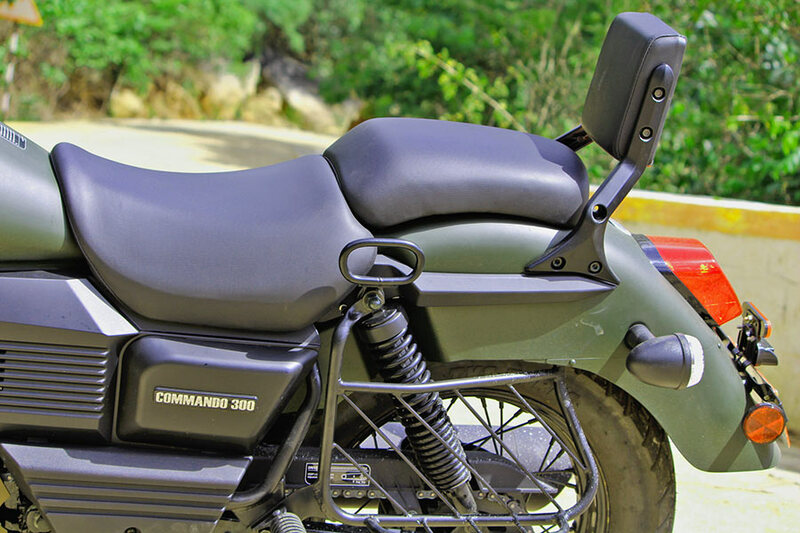 Renegade Commando’s seat height is less which opens up room for any short riders to easily ride the motorcycle. You can hear a pretty kicking Ignition sound as you start the motorcycle. 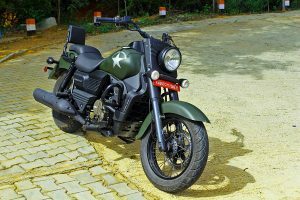 The all new UM Renegade Commando motorcycle is powered by 279.5cc single cylinder 4 stroke, 4 valve, liquid cooled, spark ignition engine. 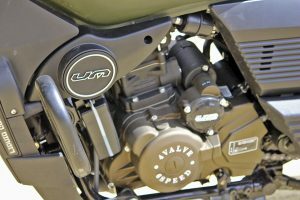 The maximum power (bhp) the Renegade Commando can churn out is 24.8hp @ 8500 rpm and motorcycle’s maximum torque is 23Nm @ 7000 rpm. 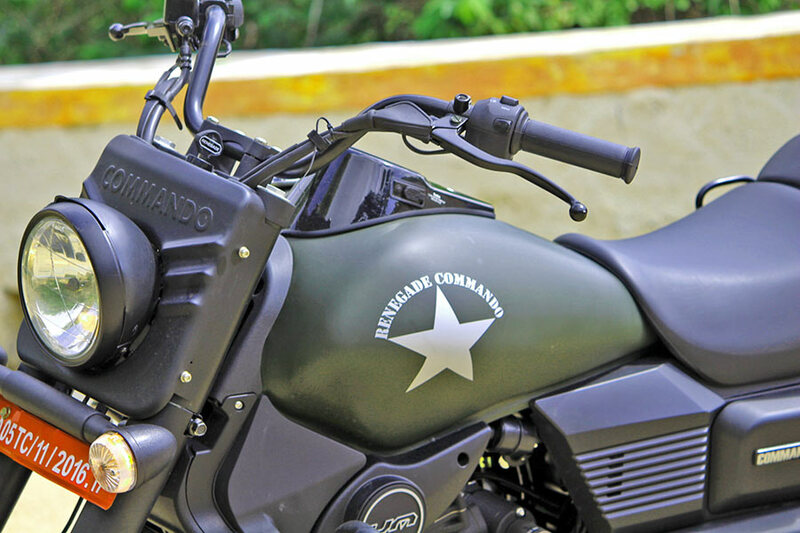 This 280cc engine of Renegade Commando is mated to a 6-Speed Synchronous mesh type gearbox. Talking about the dimensions, the fuel tank capacity of UM Renegade Commando is 18 litres. 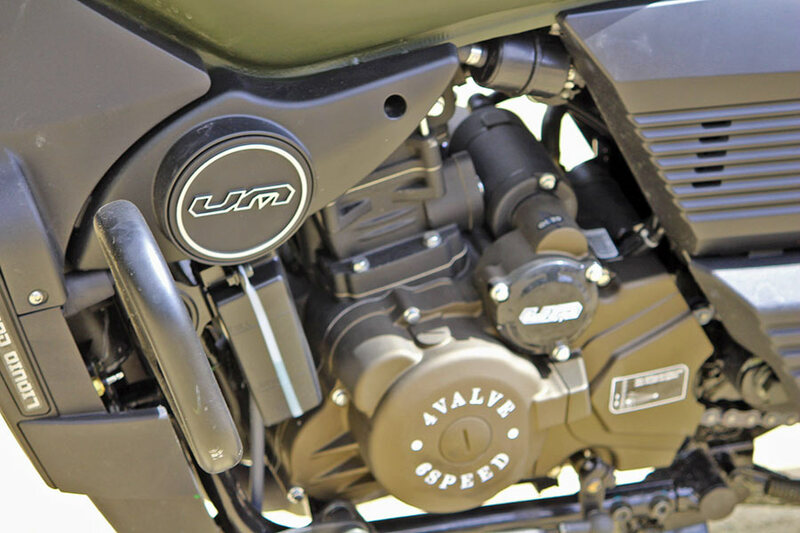 The kerb weight of UM Renegade motorcycle is 179 Kgs. Measuring 2257mm in length, 780mm in width, 1140mm in height, the Commando has a ground clearance of 200mm (as per the spec sheet) . The motorcycle’s wheel base measures 1545mm. 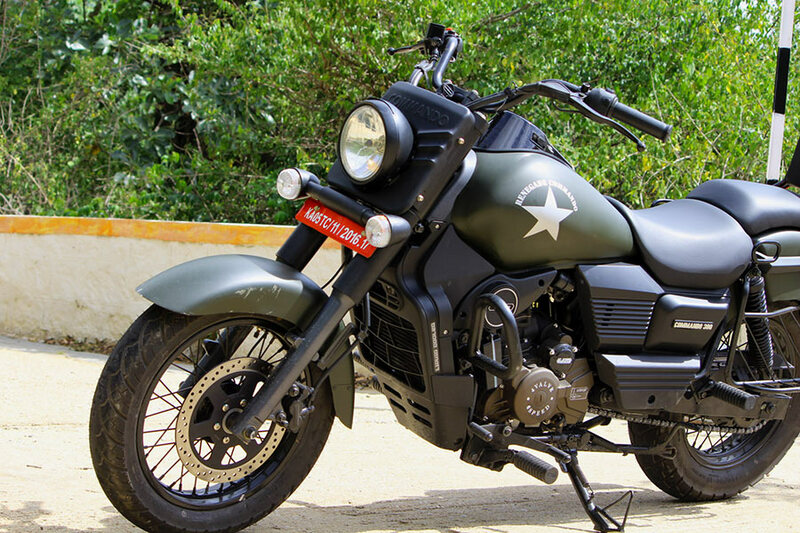 The powerful 280cc engine of Commando helps you attain good speeds in a very short interval. 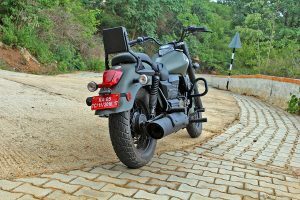 The transition between two levels of speeds (gears) happens pretty much smoothly with this motorcycle unlike Yamaha FZ250 where you can notice the impact or Jerk which is experienced by the pillion rider usually (Read FZ25 Review here). 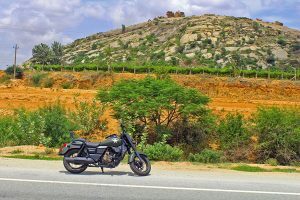 On our long ride to Avalabetta and Gudibande, a hilly place which is outside 100 Kms from Bangalore city, we experienced every bit of goodness of this motorcycle. 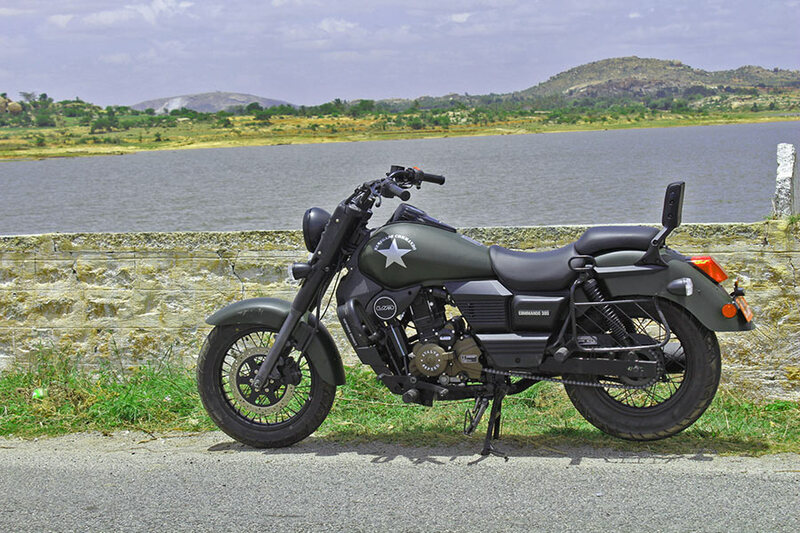 Renegade Commando is made for commuting long distance – the single most reason is the stability offered by the motorcycle and 6 speed gearbox. 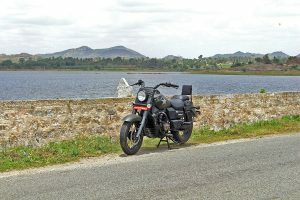 When you are cruising at a speed of 100 to 110 Kmph and when you notice there is one more gear left to change (top-gear) – that happiness is unexplainable. 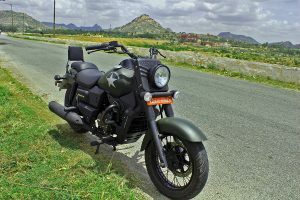 Our test ride was done wth a pillion rider on the back – and the bike remained stable and there were no single vibrations observed at high speeds. 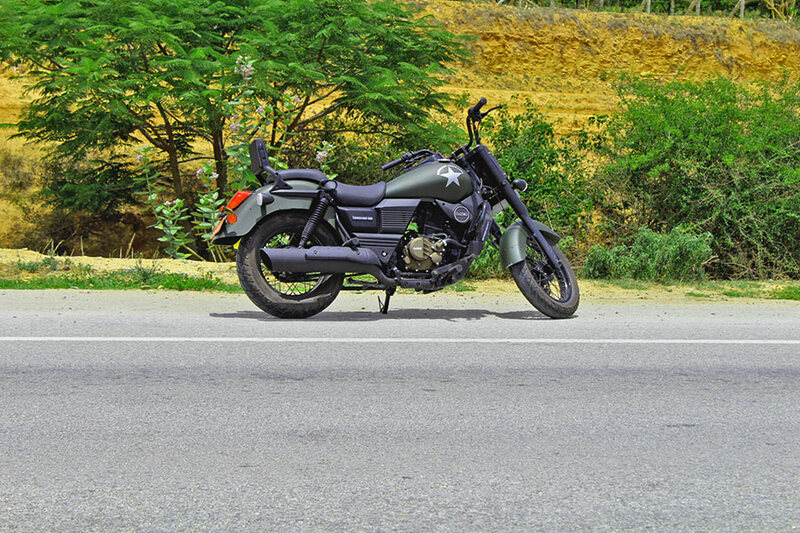 We were able to attain a maximum speed of 130-140Kmph with this motorcycle on highways. 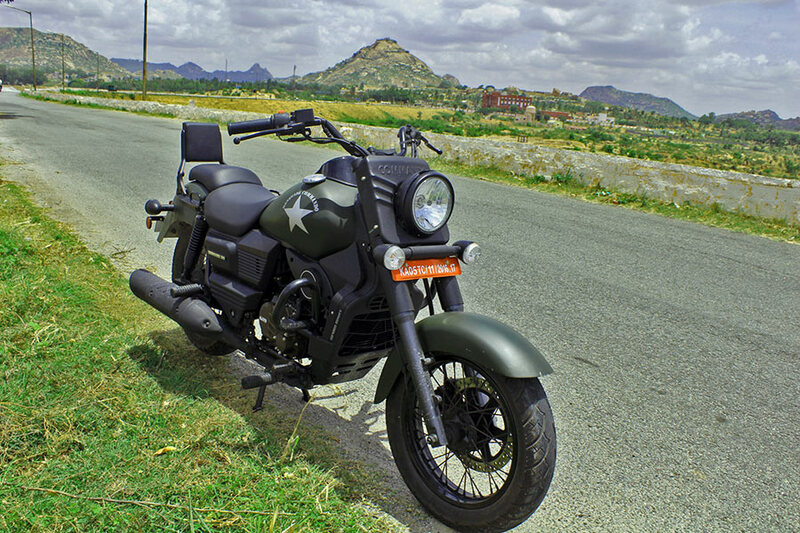 The Mileage offered by Renegade is around 20 Kmpl. 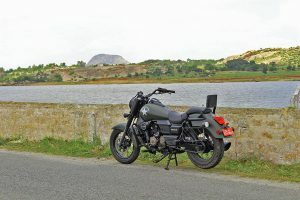 Unlike other cruiser motorcycles in the market like Royal Enfield’s, Renegade Commando did not make any loud noise or thumping sound. So people who prefer on-road presence as well as “Sound” appearance might miss the pulse. Renegade Commando might not be a wise option to choose for city-only rides because of its less radius of curvature. Taking turns in narrow roads is not too quick, you will have to follow a path to make those quick turns. 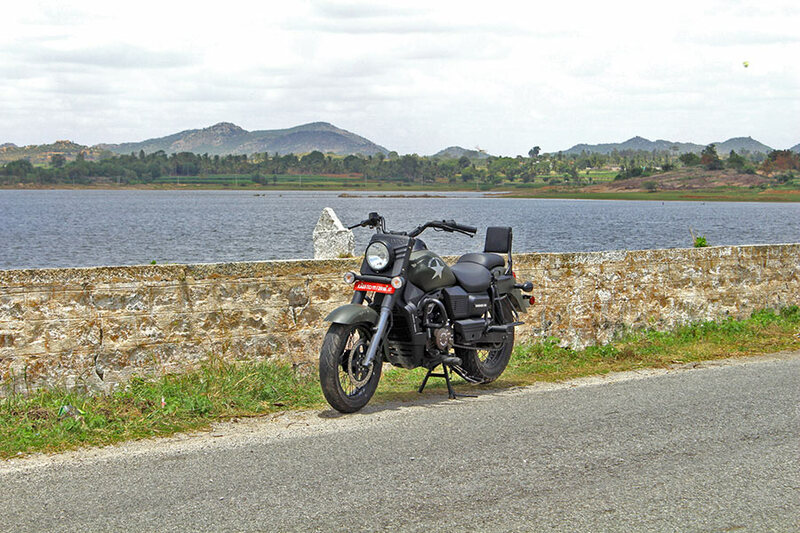 We felt the motorcycle is good for long rides / weekend rides to enjoy the most. 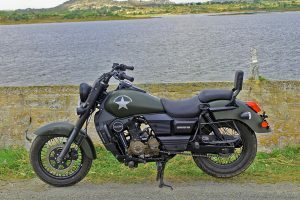 UM Renegade Commando gets 41mm Hydraulic telescopic at the front and twin hydraulic with spring suspension at the rear. The suspension is good enough to avoid abrupt jumps on speed breakers. 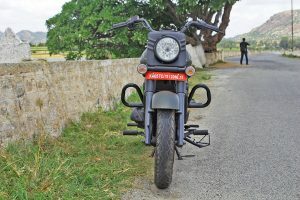 As it is a cruiser motorcycle, you have no option to stand up and ride, so sometimes you will have to get past those humpy roads relying on your suspension. UM Renegade Commando gets spoke wheels. 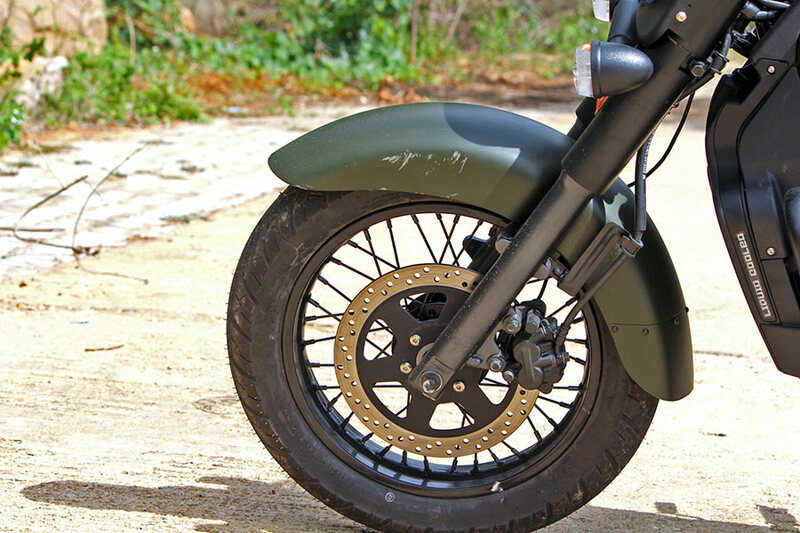 The Tyres offered in front are of dimensions 110/90-6 at the front and 140/90-15 at the rear. The brakes are responsive and good. You will be getting 280mm 2 piston caliper Disc brake in the front and 130mm rear drum brakes. 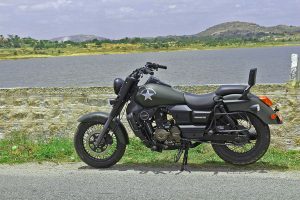 The ex-showroom Bangalore price of UM Renegade Commando is INR 2,23,000 .
Who should buy the Renegade Commando and what is our verdict? Renegade Commando is for someone who really loves owning a motorcycle which has that unique design appeal. 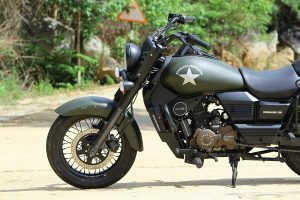 A heavy motorcycle (280cc) is offered at an attractive price point (2.23 Lakhs ex-showroom Bangalore) and it comes with brilliant looks. 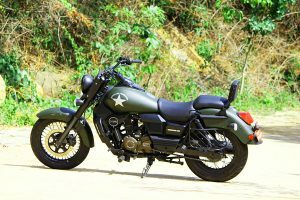 Although it misses on features like ABS and few aspects, it deserves to be a straight and serious option for someone want to get started with long-rides on cruiser bike and for those who are in love with the shape of Commando. The photo gallery of UM Renegade Commando can be found below. All the high resolution photos can be found here and here. 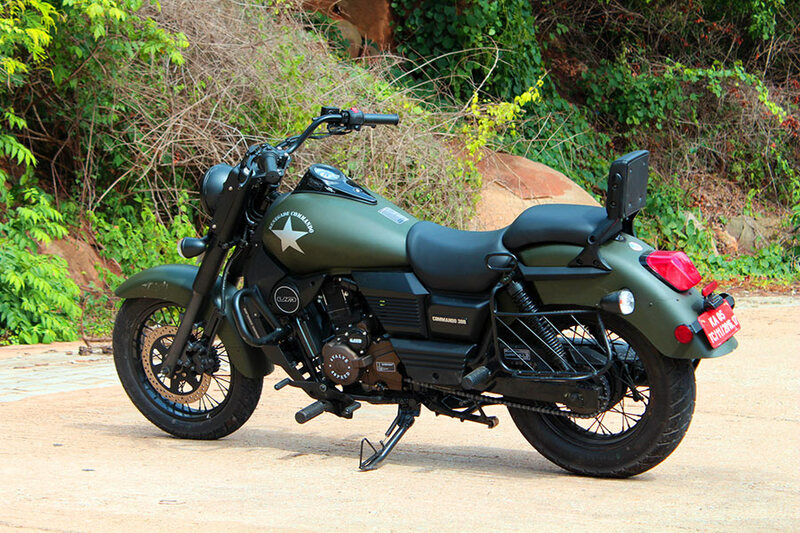 This bike is all about first impressions. 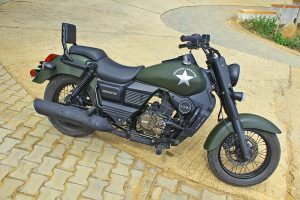 Its both a good bike for the Indian market and a poor one at the same time. Good for the Indian market because the macho styling, pseudo American Cruiser and military trim will appeal to the image conscious Indian male. It’s the perfect weekend statement for the 20 something aspiring executive with a Rambo fantasy. 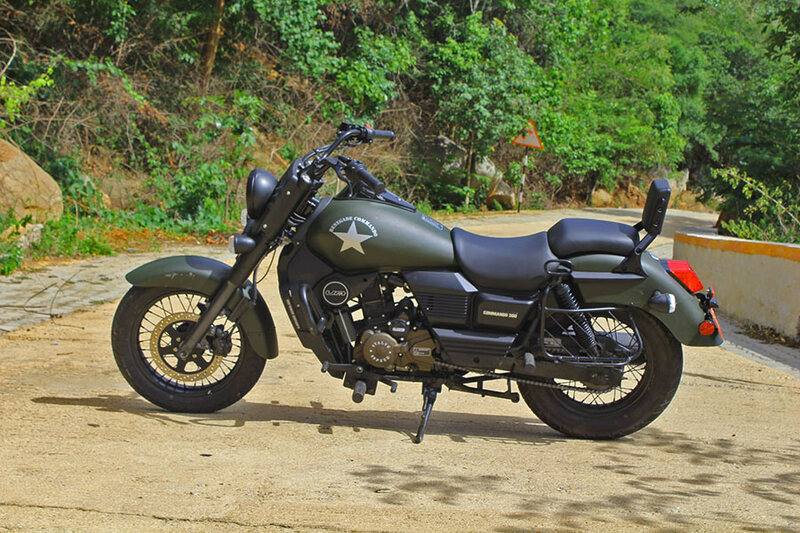 As I rode it around Koramangala it generated a lot of admiring first looks. 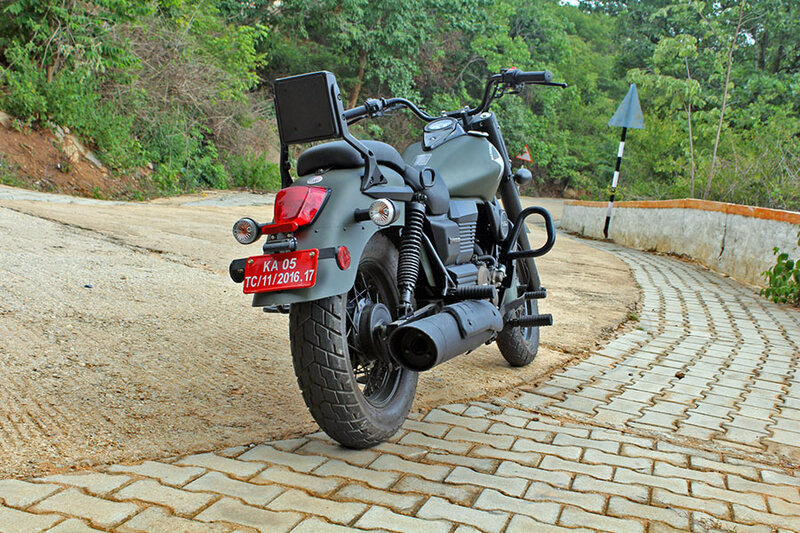 It allows the rider to feel what sitting astride a Harley would be like. All be it without the price tag or the exhaust sound. That the one are I can imagine being modified as the type of rider who would be attracted to this head turning tank would also need to be heard arriving. A poor one because if it’s all about creating the first impression then this is not ‘Royal’ so will lose points immediately in India. Plus it’s a budget bike not guaranteed to boost the riders ego. The other issue in the Indian market besides this not being a premium product. Is the build quality. It’s expensive for the quality. Looking at the components, parts are very simple in design fabricated in heavy plastic and mild steel. This adds to the weight of 179kg. The ground clearance is a bit low with 150mm at exhaust. Key sticky on locking. The bike was easy to ride even with that weight. Plus the low seat height made it easy to balance when stationary. 6 Speed transmission makes it convenient for city use. It has enough power for getting around town and its 24.8 bhp is good enough to cruise comfortably on the highway. Seat is very comfortable. The USB charger on the tank is pretty handy. Get an bullet proof phone holder and it would all match.